Feeding time at an ostrich farm. A troop of ostriches approaches a cart carrying prickly-pear leaves for them to eat. This is a rare photograph from the late 1800s. It is in the public domain and might make an interesting addition to a work about ostrich farming or what the birds eat. 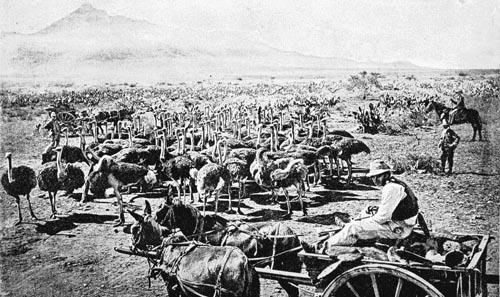 This and a number of the other vintage ostrich photographs may have been taken by Annie Martin, the author of Home Life on an Ostrich Farm which was published in 1891.